A 39-year-old woman with history of C-section presented with complaint of intermittent left abdominal pain with a palpable nodule for the past six months. The pain coincided with her menstrual cycle. 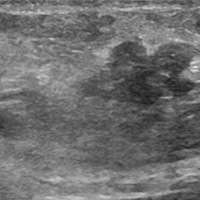 Sagittal ultrasound image (Figure A) of the palpable nodule demonstrates a lobulated hypoechoic soft tissue lesion located within the subcutaneous tissue. 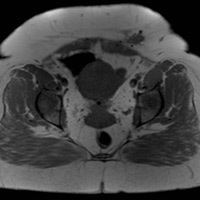 Axial T1 MR (Figure B) image demonstrates a lobulated lesion, isointense to muscle, in the left anterior abdominal wall subcutaneous tissue. There is adjacent artifact from surgical clips. Axial T2 MR (Figure C) demonstrates intermediate signal within the lesion with subsequent intense enhancement on Axial T1 postcontrast imaging (Figure D). The differential for abdominal or pelvic wall masses in patients who have undergone surgery is broad. Examples include desmoid tumor, hematoma, suture granuloma, postsurgical seroma, keloid, incisional hernia, and abscesses. Endometriosis also has a low potential for transformation to endometroid adenocarcinoma. Desmoid tumors may be the closest radiographic mimic, but does not typically present with cyclical pain. Imaging with ultrasound, CT, or MR can help exclude hematoma, seroma, hernias, and abscesses. Thus, clinical imaging, and in many cases pathologic correlation, is often needed for diagnosis. Scar endometriosis is endometrial tissue identified in postsurgical scars of the abdominal or pelvic wall, most commonly after C-section, occurring in approximately 0.3% to 1% of cesarean deliveries, and in hysterectomy. Diagnosis is suspected with the correlation of imaging findings and clinical history and confirmed after surgical excision. Patients typically present with cyclical pain at a location associated with a postsurgical scar. Imaging findings vary with the phase of the menstrual cycle, stromal and glandular elements, bleeding, inflammation, and chronicity. The typical presentation demonstrates a T1 isointense, T2 hyperintense heterogenous nodule with adjacent surgical scar. Varying enhancement can be seen. Treatment involves surgical resection for diagnostic and therapeutic purposes. Wide surgical resection is typically required to prevent recurrence. Medical treatment can be attempted with hormone suppressant agents but symptoms typically recur after the cessation of therapy. — Kanwar Singh, MD, and Rayhan S. Hai, MD, are internists at The University of Texas Southwestern Medical Center in Dallas. — Pramod Gupta, MD, is a radiologist at the Dallas VA Medical Center. Gidwaney R, Badler RL, Yam BL, et al. 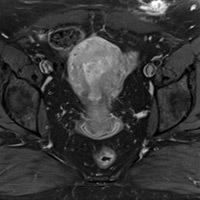 Endometriosis of abdominal and pelvic wall scars: multimodality imaging findings, pathologic correlation, and radiologic mimics. RadioGraphics. 2012;32(7):2031-2043. Ozel L, Sagiroglu J, Unal A, et al. Abdominal wall endometriosis in the cesarean section surgical scar: a potential diagnostic pitfall. J Obstet Gynaecol Res. 2012;38(3):526-530. Hensen JH, Van Breda Vriesman AC, Puylaert JB. Abdominal wall endometriosis: clinical presentation and imaging features with emphasis on sonography. AJR Am J Roentgenol. 2006;186(3):616-620.